Bronx Week, a highly-anticipated annual borough-wide celebration of the best and the brightest, takes place May 11-21, 2017. The festival consists of a series of events designed to honor those citizens and institutions that contribute greatly to the rich culture and diversity which defines the uniqueness of The Bronx. 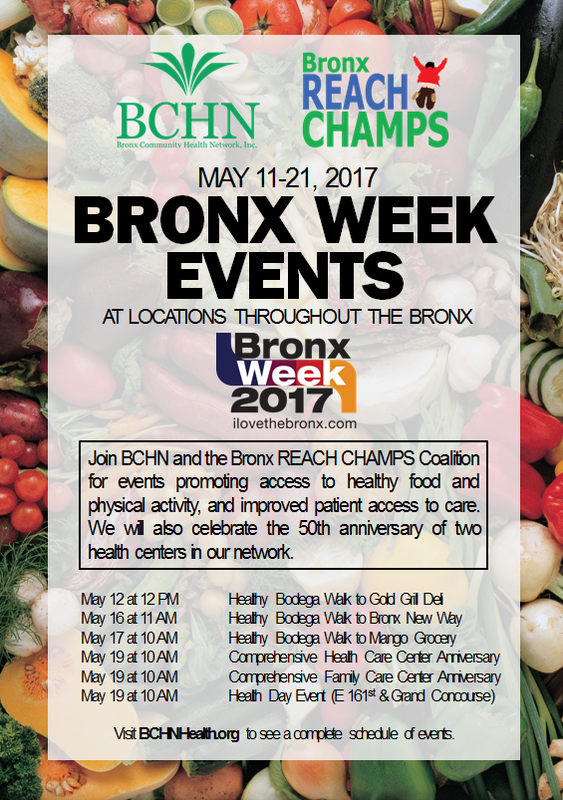 Bronx Community Health Network (BCHN) is once again partnering with Bronx Borough President Ruben Diaz Jr. for a Health Day event on May 19. You will also find us at numerous events throughout the borough, promoting health and wellness, and connecting patients to the vital services they need. BCHN is partnering with Montefiore's Healthy Store Initiative on staff and patient walks from our health centers to local bodegas that are part of our Bronx REACH CHAMPS Coalition. We will also be celebrating the 50th anniversaries of two of our health Centers, Comprehensive Health Care Center (CHCC) and Comprehensive Family Care Center (CFCC). CHCC and CFCC were first to join our Network back in 1997. Note: In addition to the anniversary ceremonies above, a team of health educators and community health workers will be leading activities throughout the day. In the morning (10:00 AM - 12:00 PM), Chef Geneva Wilson will be providing healthy cooking demonstrations for the children's groups that have been invited to attend. In the afternoon (12:00 PM - 2:00 PM), several members of BCHN's outreach team will be leading an interactive sugar-sweetened beverage activity, as well as two discussion sessions during lunch on the lawn: "Cut the Salt" Hypertension and Stress & Health.